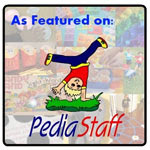 There are a lot of great applications on the market for aphasia, apraxia of speech, and autism. One set of applications that provide visual and auditory cues for people with aphasia are the SpeakinMotion applications. These include VAST Autism 1 - Core, VASTtx - Key Words, VASTtx - Therapy Samples, VAST Songs 1 - Intro, and VAST Autism 1 - Core (Spanish). 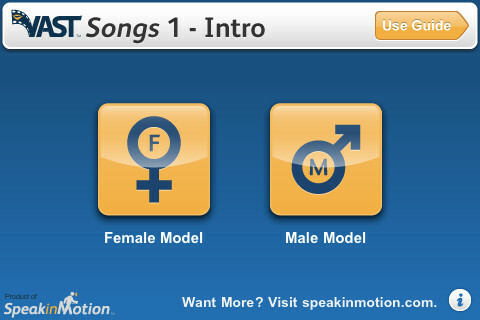 SpeakinMotion also offers a custom recording service available on their website. These are the applications I wish I had when I was helping people who had aphasia in the graduate school clinic. 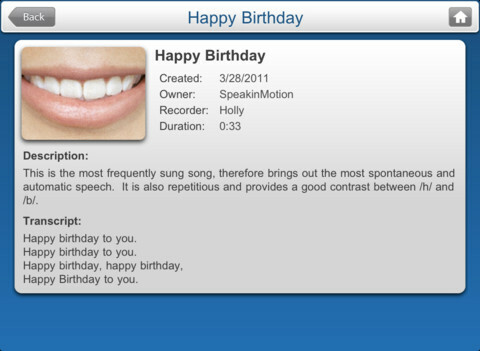 To learn more about the English language SpeakinMotion applications and to enter a giveaway of each, continue reading. Information Page - Pressing the "i" button at the bottom of the page will bring you to more information about the application, company, developer, website, and more. You can also read the credits and version of the application. 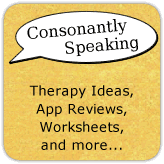 This application was developed by Lois Jean Brady, speech-language pathologist, author of Apps for Autism, writer at www.proactivespeechtherapy.com, and creator of Autism Today TV. User Guide - Pressing the "User Guide" button at the top, right hand corner of the application's Main Page. This will discuss guidelines for using the application as step-by-step instructions. More Tools - There are four common tools to the applications: Mirror, Tutorial Video, Customize Playlists, and Custom Recording Service. Pressing the Mirror button will use the front camera as a mirror so that users can view their own mouths/speech. The Customize Playlists feature allows you to build custom playlists for users by pressing the "+" button at the top of the page and add a Playlist Name. Then, choose whether or not you want the items on the list to appear in random order. Next, press "Done" to move to select videos for the list. Press on a video title to add it to the playlist. When you press on the video, a checkmark will appear next to it. Press "Done" once you have completed the playlist. The playlist will then be added to the "Playlists" menu. Tutorial Video - Brings you to a Tutorial video of the application. Custom Recording Service - Brings you to more information about the custom recording service available from SpeakinMotion. 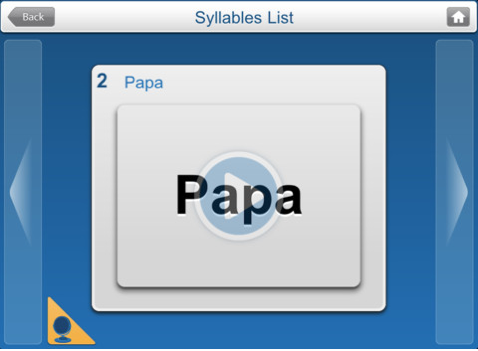 Application Play - All of the applications have video recordings of words, syllables, phrases, sentences, songs, and/or paragraphs. Each of these videos shows only the mouth of the narrator (most of the time female, but you can choose a male model on the VAST Songs 1 - Intro) and plays the audio along with it. Many of the words/syllables/phrases/sentences/songs/paragraphs are repeated a second time or added onto on the video. Each of the videos has an information page about it stating the date it was created, recorder, description of the video, and a transcript of the video. To choose a video, press the play button in the middle of it. You will then see the text of the word followed by the video model's mouth and the word(s) stated aloud. You can pause a video by pressing on the video and then pressing the pause button. If you wish to exit a video before it has finished, press in the middle of the video and the done button will appear to be pressed. Choose a Male of Female model on the main page. Each video provides video and auditory cues for people who have aphasia to help them become more fluent speakers, especially those who have difficulty verbalizing. The videos consist of common sounds, words, phrases, sentences, and paragraphs used in everyday situations. There are multiple videos for each category! 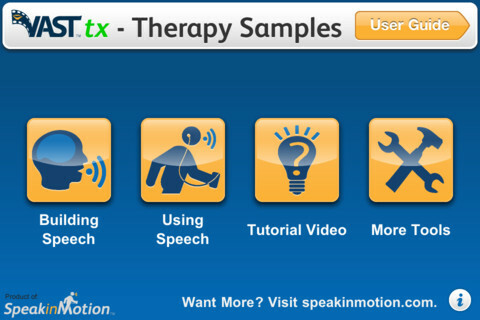 SpeakinMotion offers custom recording via their website so that people with aphasia can have personalized videos with words, phrases, and sentences that they need to be able to say! The applications are easy to use and the videos are easy to view. Aphasia - Use the applications as a visual and audio cue to help people who have aphasia verbalize common sounds, words, phrases, and sentences. Apraxia of Speech - Use the applications as a visual model of articulatory placement for speech sounds for people with apraxia of speech. They can also hear the different sounds in the words and practice them along with the application. Social Skills - Use the VAST Autism 1 - Core and VASTtx Therapy Samples common phrases/sentences to help them learn conversational language to use in common situations. Articulation - Use the VASTtx Key Words application to choose sounds that students are working on, play the video with the letter/word/phrase, and have them practice their sounds. Fluency - Have students practice the phrases on the application via the mirror as well as slowly first, then faster, just like in the application, using fluency strategies. 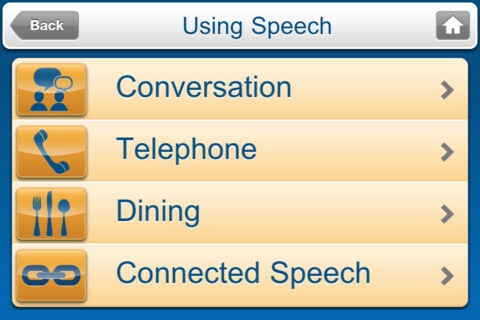 All of the SpeakinMotion applications are available for the iPod Touch, iPhone, and iPad. VAST Autism 1 - Core is $4.99, VASTtx - Therapy Samples is $9.99, VAST Songs 1- Intro is $4.99, and VASTtx - Key Words is $12.99. VAST Autism 1 - Core (Spanish) is also available for $7.99. 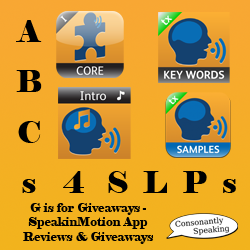 Consonantly Speaking was given copies of each of the English versions of the SpeakinMotion applications to give away with this review. No other form of compensation was received. Enter the Rafflecopters below for your chance to win one of the SpeakinMotion applications!